Prior to breaking his leg and landing the Injured Reserve, Denver Broncos center Matt Paradis was playing at extremely high level. He anchored one of the best run-blocking offensive lines in the NFL and was far from a liability in pass protection. If healthy, the 29-year-old Paradis can fill in for any offensive line as a key contributing starter in 2019 and beyond. Paradis isn’t the long-term, blockbuster free agent addition many teams seek out in free agency, but he offers value to an already competitive NFL team in need of an upgrade at center. 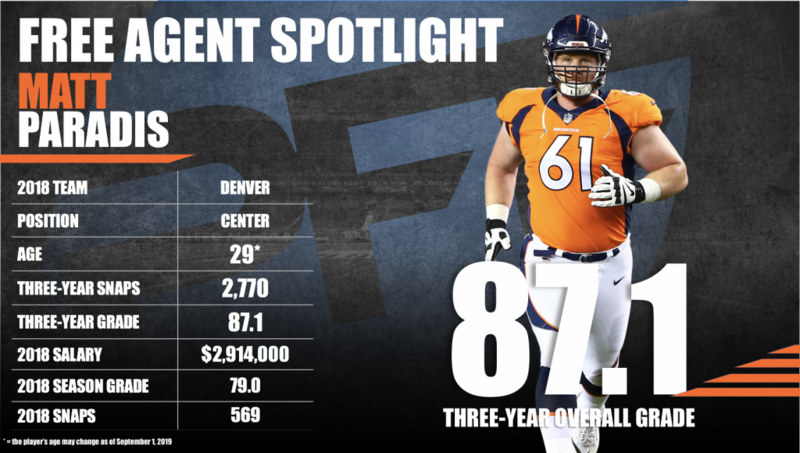 Subscribe to Pro Football Focus’ ELITE subscription to research Matt Paradis’ grades, advanced stats, snaps and more in Premium Stats 2.0.